Advanced Open Water Diver certification is the chance to expand and continue your diving knowledge in the care of a PADI instructor. After completing the academic training, you will also complete two “core” dives, “Underwater Navigation” and “Deep Diving”. You will also select and complete three elective dives from your choice of: Multilevel Diving, Wreck Diving, Night Diving, Drift Diving, Photography, Underwater Naturalist, Boat Diving, and Search and Recovery. The Advanced Course can be combined with beach dives, day trips or a liveaboard cruise. You choose what option interests you the most! If you have difficulty deciding, your instructor will help you choose the specialty training that is right for you. This course is highly recomnended before participating in a Similan Island Liveaboard. The Advanced Course knowledge development is now also available online. If it's been a while since your last dive, or you feel that your skills and knowledge are a little “rusty”, then take this PADI refresher course. You can refresh your knowledge with the PADI eLerning Scuba Tune Up or our instructor will review your diving theory and skills, just to make sure that you haven't forgotten anything! You have a choice between a half day course includes classroom and shallow, confined water training, or a day on our day trip boat with two or three dives. It is highly recomnended to freshen up your skills before participating in a Similan Island Liveaboard. Many of you have heard or read about nitrox diving. Nitrox usually refers to a mixture of nitrogen and oxygen with a higher percentage of oxygen than normal air (EANx - Enriched Air Nitrox). The two most commonly used mixtures are EANx 32 and EANx 36 with 32% and 36% oxygen concentration, compared to 21% in normal air. Used by scientific and naval divers since the 1960s, Nitrox allows divers to safely extend their no decompression limits (see table). The one - two day PADI Enriched Air (Nitrox) Diver course includes academics, cylinder analysis, and two Nitrox dives. For more information see our TEC Diving pages. The famous Enriched Air Nitrox Course knowledge development is now also available online. In our global world, more divers are learning the benefits of diving Nitrox. The bottleneck is the lack of facilities that can offer the gas mixes. Setting up and operating a safe gas mixing facility can only be done with the right knowledge and equipment. That is what this course is all about. The DSAT Gas Blender course will train you to become a competent and qualified gas blender, allowing you to provide Nitrox and Trimix gas mixes to appropriately certified consumers. You will learn the physical properties of oxygen, its associated hazards, handling requirements and what cleaning equipment is necessary. Finally, you will learn the five methods of obtaining the desired enriched air Nitrox mix and the various methods used to obtain proper helium Trimix mixes. For more information see our TEC Diving pages. There must be some area of diving that particularly interests you - let us help you to develop your skills in this area and expand your knowledge. Our instructors now offer you the complete range of PADI specialties. Favorites include: Underwater Naturalist, Deep Diver, Wreck Diver and Night Diver. 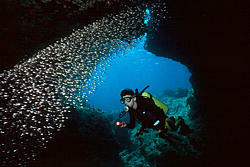 Specialties are available in conjunction with beach dives, daytrips or liveaboard cruises to the Similan Islands. The PADI Emergency First Response (EFR) - a basic course in cardiopulmonary resuscitation and emergency care. This course teaches you simple, logical steps that you can take to assist somebody who needs help. 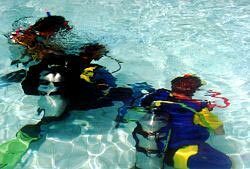 With practical application and “hands on” experience this course becomes beneficial for both diver and non-diver. The PADI Emergency First Response course meets the certification requirements for several PADI courses. The PADI Rescue Diver course is designed to develop the necessary knowledge and skills for you to effectively perform rescues and assists, manage diving-accident situations and render proper first aid when necessary. Youll find the course enjoyable and highly interesting,although the nature and context in which such training may be used is quite serious. The primary objective of this course is to prevent the need for use of rescue skills. A good diver does not only solve problems, he prevents them in the first place! The course includes five Academic Sessions and twelve Open Water Training Exercises over a minimum of three days. The PADI Rescue Diver rating is a prerequisite for all PADI leadership programs. If you are interested in a professional career in diving, we welcome you aboard our award winning PADI Go Pro programs: Divemaster, Assistant Instructor, Instructor & Career Development Courses. For comprehensive information please visit our IDC/CDC section.